Psyllium and unprocessed wheat bran are equally beneficial in your diet. The former is a type of soluble fiber, while the latter is a type of insoluble fiber. You should get adequate amounts of fiber in your diet eating plenty of fresh produce and whole-grain foods. In some cases, however, you may need a fiber supplement. If you decide to take one, let your doctor know ahead of time to ensure it doesn't interact with any of your current medications. Fibers can be either soluble or insoluble, depending on their function in your digestive tract. While either type stays relatively intact through your gut, soluble fiber breaks apart and ferments in your colon, the lower part of your intestine. This process feeds the natural good flora of your intestinal tract. Insoluble fiber, sometimes known as roughage, sweeps through your digestive tract like a broom, pushing out waste. Both types of fiber are essential in your diet and most fiber-rich foods offer some of both. For a healthy digestive tract, you need to consume 14 g of total fiber for every 1,000 calories you consume, the Centers for Disease Control and Prevention reports. Following an average 2,000-calorie diet requires you to ingest 28 g of dietary fiber each day. 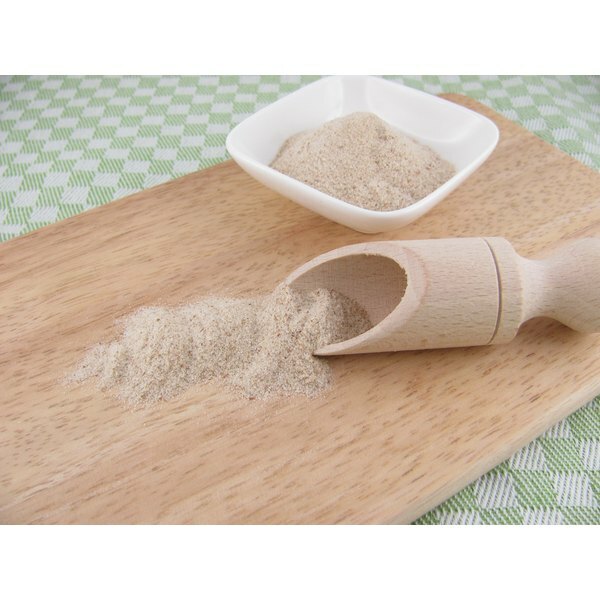 Psyllium fiber comes from the husks of seeds from psyllium plants. This soluble fiber has an array of benefits in your digestive tract. Since it is able to absorb water, it can help relieve diarrhea. Psyllium fiber reduces digestion speed, which slows the absorption of nutrients in your system. For this reason, psyllium may be beneficial in lowering cholesterol and maintaining your blood sugar levels. Additionally, researchers at the University of Florence in Italy published a study in the "Techniques in Coloproctology" journal in 2011 looking into the benefits of psyllium fiber for obstructed defecation. This condition leads to an inability to move your bowels, resulting in severe constipation. Patients given psyllium, as compared to a general high-fiber diet, had quicker improvements in obstructed defecation symptoms as well as having softer stools that were easier to pass. Unprocessed wheat bran is a type of whole grain that contains all parts of the kernel: germ, endosperm and bran. The tough outer shell or bran is rich in insoluble fiber. This beneficial fiber adds bulk to your stools as it sweeps through. Since insoluble fiber from unprocessed wheat bran keeps your bowels moving regularly, it reduces your risk of developing hemorrhoids, certain colorectal cancers and diverticular disease, notes the Mayo Clinic. Having diverticular disease causes pouches to form in your intestinal walls where food gets stuck. Eventually, this leads to painful inflammation, known as diverticulitis. Fiber is an essential part of your diet, but if you don't normally consume adequate amounts of fiber, suddenly increasing your intake may lead to gastrointestinal problems. Too much fiber causes gas, bloating, cramping, diarrhea or even constipation in some people. To reduce your risk of adverse side effects, slowly boost your intake 2 g daily and monitor your reaction. Increasing your intake over a period of several weeks allows your body to get used to it; thus, your digestive tract passes fiber with minimal issues.